Wednesday October 4 1911 I did a big washing and some sewing. Will & Art Jones worked all day at the division fence and got it done. 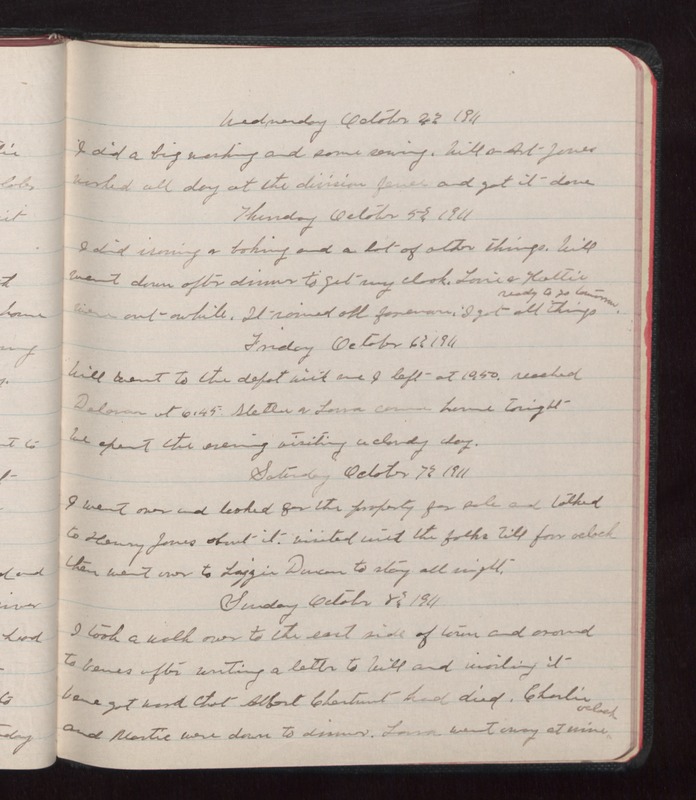 Thursday October 5 1911 I did ironing & baking and a lot of other things. Will went down after dinner to get my clock. [Lorie?] & Hattie were out awhile. It rained all forenoon. I got all things ready to go tomorrow. Friday October 6 1911 Will went to the depot with me I left at 10.30. reached [Delamar?] at 6.45. [Stellan?] & Lorna came home tonight We spent the evening visiting a cloudy day. Saturday October 7 1911 I went over and looked for the property for sale and talked to Henry Jones about it. Visited with the folks till four oclock then went over to Lizzie Duncan to stay all night. Sunday October 8 1911 I took a walk over to the east side of town and around to [illegible] after writing a letter to Will and mailing it [illegible] got word that Albert Chestnut had died. Charlie and Martie were down to dinner. Lorna went away at nine oclock.